Del.icio.us is an online bookmark sharing system that works just like your favorites function on your web browser, except the bookmarks (or "tags" as they are called in Del.icio.us) are accessible to anyone via the web. From my leadership blog home page (http://pliblog.yournextspeaker.com/) anyone can access the more than 400 pages I have tagged in our PLI (Personal Leadership Insight) Del.icio.us tag system. Each page is tagged under one of the ten PLI Essentials (seen in this picture). You can also see at the bottom of the picture that I have started tagging pages that deal with authenticity, the core focus of this blog. As a reader of this blog, you are obviously interested in learning how to communicate better. 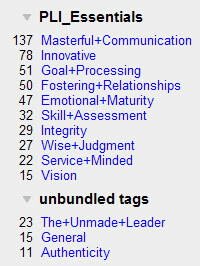 I highly recommend you spend some time perusing the over 100 Masterful Communication Del.icio.us tags. They are filled with speaking tips, conversations tips, team communication strategies, etc. To access them you can go through the PLI blog site or you can just click here. I add more every week. The iceberg above the water represents the content that makes it into your speech or presentation. 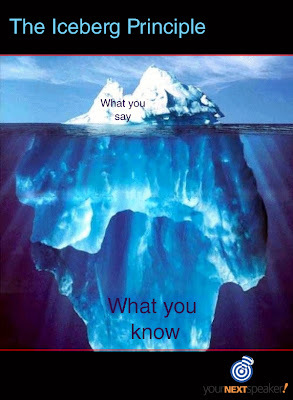 The glacier beneath the water represents what you know about your topic that doesn't make it into your presentation. The iceberg will only stay afloat if it is held up and supported by the glacier. Same way with your presentations. Authenticity Rule #2 is Know Your Content. Presenters who are able to present with the presence and grace of an iceberg have an entire glacier of expertise, study and knowledge holding them up. Just north of Half Moon Bay in Northern California is a surfing mecca called the Mavericks. This magical place creates the largest waves along the California coast line (10-20 feet high, lasting up to 20 seconds). The Mavericks is able to produce such large and powerfully fast waves because of the shape of the sea floor, the angle of the coastline and the distance the waves have traveled. Here is a flythrough video that illustrates the unique topography creating Mavericks. Each of these elements alone (sea floor shape, coastine angle and wave distance) do not create powerful waves. Combined together, however, and you get this. A natural power base. 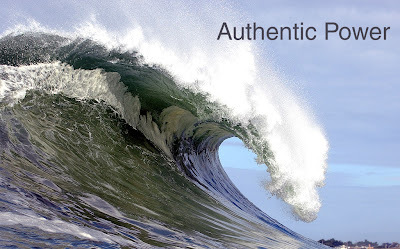 Metaphorically, it doesn't get any better than the Mavericks to describe what happens when a speaker, trainer and/or teacher lets authenticity rule their preparation and presentation. There exists a natural and unique power base that only lives within you. No one else anywhere can bring to the shore what you can. Of course, here is the big secret. You have to figure out what your "sea floor, coastline angle and wave distance" are. In other words, what are the core power base components you have at your disposal that you need to combine and start making waves with? To begin down this path of self-awareness, click over to my Personal Leadership Insight blog and use the STEEP self inventory model as a guide to finding your Mavericks power base.